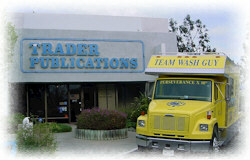 Trader Publications prints, Auto Trader, Boat Trader, Truck Trader, Plane Trader, Equipment Trader and many other publications that help individuals and companies sell their used equipment, automobiles and boats quickly. It works and surely you have picked up a Trader Publication at the counter of a C-Store before and paged through it's pictures of things to buy. It is an Ebay in a newspaper format. Trader Publications is said to have sold more used vehicles than any other company besides Auto Auctions, AutoNation and Car Max. Of course with our group of brand names able to wash and detail just about anything you can see why a visit to their National Head Quarters was warranted. We salute all those companies who are in our industries through think and thin and economic sector rotations and cycles. They were here yesterday and Trader Publications will be here tomorrow, and so will we. WashGuys.